Greetings friend! I hope this letter finds you well. I’m writing from the Anacortes Ferry, which is currently navigating the labyrinth of the San Juan Islands, bound for Victoria, BC. For the next week, Aubrey and I are road tripping across Vancouver Island to Tofino. I’m praying for good surf, but it can be a crap shoot this time of year. Surf or not, it’s gorgeous out here. Temps are hovering around 50-60 F, which is a much-appreciated break from the sweltering heat of Portland. In other news, we’ve managed to acquire one hell of a vessel for this expedition. 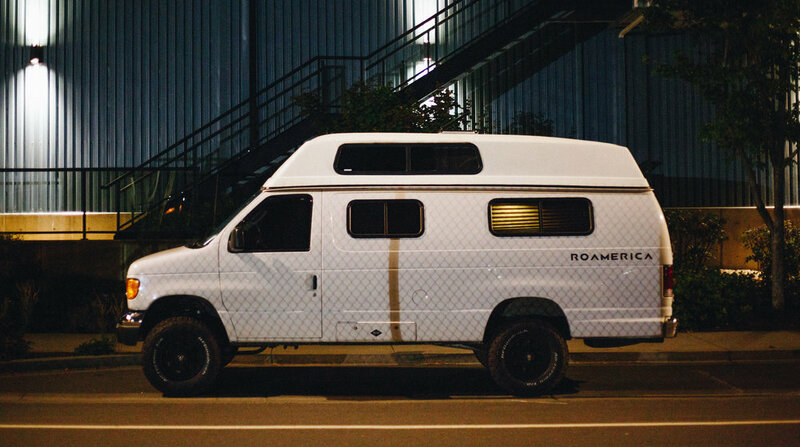 She’s a ROAMERICA RENTAL—a lifted, white Ford E250 Sportsmobile named Echo, and she’s absolutely decked, inside and out! Refrigerator, stove, sink, countertops, battery powered lights, beefy suspension, BF Goodrich AT tires—you name it. I feel as though I’ve died and gone to some sort of dirtbag heaven. Hah! I’m ruined for truck camping. Should you ever find yourself captaining a camper van, here’s a quick note: It’s a behemoth to stop. With all this extra weight, I’ve deemed it necessary to leave a minimum of 2.5 car lengths. Other than that, she’s a dream. It’s funny how a camper van changes the dynamic of road tripping. It even changes the dynamic of how you connect with other travelers. Just moments ago, an older couple knocked on the driver side window and asked us about our van and our trip. We invited them inside and started chatting. People love these adventure mobiles. I suspect this theme of meeting people because of our rad van will be consistent throughout the trip. Anyway, we’re set to arrive in Victoria around 3 p.m., and then we plan to meet with local friends for drinks and dinner. I’ll send along my favorite pictures as we settle into the expedition. Wish us luck, and take care! I’ll talk to you in a week. Our first night was spent on a quiet backstreet in Victoria, BC. Pleased to discover that the van is supplied with GSI French press and Primus pots, pans, and mugs. 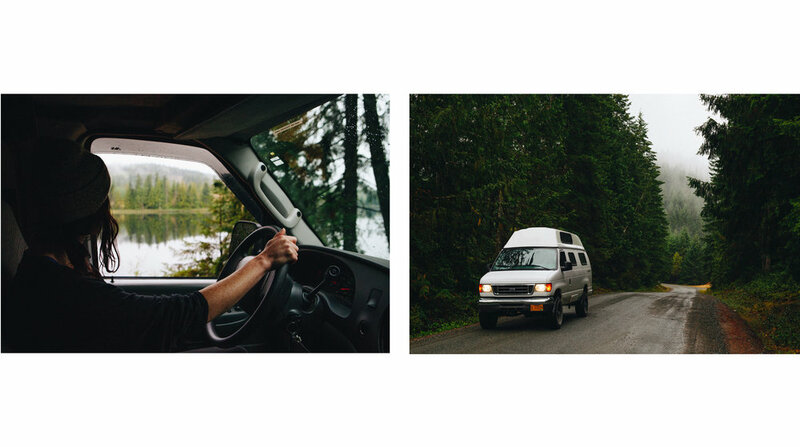 Photographs from our first day and arrival in Tofino, BC. After a few glacial lake swims during our traverse across the island, we found an old logging road to call home for the night. Also, a word to the wise, gas stations are sparse between Victoria and Tofino. Best to fill up before starting the drive. Full transparency here: I thought it likely that maple syrup’s association with Canada might be some foolish main-lander appropriation of the Canadian Maple leaf. BUT, a little curiosity blended with a rudimentary education from Google revealed that before the first European settlers, Canada’s aboriginal people discovered the delicious sap and harvested it every spring. And this discovery may very well have served as the catalyst for the Maple Leaf symbol. Parked above a glacial lake. Smoke from rampant summer wildfires mask the peaks of evergreens in the distance. The sunrise was surreal from the smoke. Surf is mushy at first but cleans up later with four- to five-foot faces. After surfing, we explore a nearby lighthouse. The dull bellow of the fog horn mingles with the surging of water against rocks. A doe and her fawn emerge from pines behind us, navigate the rocky coastline for a moment, and then disappear up into the forest again. Time seems to stop. Totem poles made by the First Nations to the Pacific Northwest. These serve as symbols and commemorations of ancestries, influential people, and past events. Exploring Strathcona Provincial Park on the way back across the island. I have little doubt that the frigid, emerald waters of Myra falls has landed on my list of best summer swimming holes for years to come. Lucky accommodations for our final evening on Vancouver Island. We found this free campsite below the Strathcona Dam. As if to usher us home, fog and rain blew in on our last morning during the drive back to the Nanaimo Ferry.